Why would a couple of pages torn from the guestbook of a hunting club be housed in the Law Society of Upper Canada Archives? 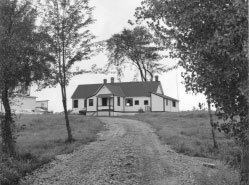 The Black Bay Duck Club, near Ottawa, provided a restful get-away for its owners and their guests from the 1920s to the 1970s. In October and November 1944, several Soviet diplomats were guests at the club and remarked on the excellent shooting. The revelation that Soviet spies had been operating in Canada during the war-time alliance triggered the Cold War in this country. As part of the ensuing 1946 Royal Commission on Espionage in Canada, incriminating documents were traced to Soviet diplomats by matching their handwriting to their signatures on the Black Bay Duck Club guestbook. 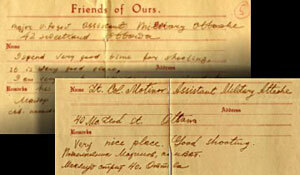 The existence of the guestbook had come to the attention of the RCMP by coincidence. One of the club's co-owners was chatting with the head of the RCMP at an Ottawa dinner when the Commissioner revealed his concern about linking the documents found on the alleged spies to the Soviets because they had no genuine handwriting samples. The Commissioner was astounded to be told of the existence of the guestbook and immediately arranged to pick it up that same night. The Black Bay Duck Club guestbook thus played a role in the beginnings of the Cold War, a conflict that preoccupied the world for half of the twentieth century. To learn more about "The Gouzenko Affair," visit the Parks Canada web site. Lawyer A. Burke Doran donated these pages to the Law Society Archives (Black Bay Duck Club Book Law Society of Upper Canada Archives, M22). Mr. Doran is the nephew of one of the original owners of the Club, Jack Heney, from whom he inherited the pages and the photographs. 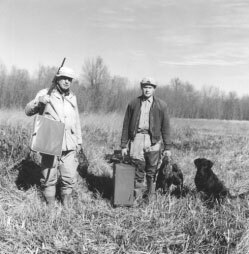 Other Club owners were James Bonbright, who took the photographs, Shirley Woods, and Dr. Tanney. Later Mr. Doran's father also became a co-owner of the club. The photographs appear courtesy of Mr. Doran.